The society can’t teach you how to love or who to love. It especially can’t and should never dictate your own way of living. “The Lobster”, co-written and directed by a brilliant and one of the most intelligent and imaginative filmmakers of our generation Yorgos Lanthimos, brings you a possible future that you wish to never be part of it. It is also about a man who accepts love the way it is. It’s about the failure of the common foundation that this film is built on. It’s about feeling; passion and strong determination of two people: nothing can be stronger than true love and a desire to be together at any cost. I mean, literally, at any cost! After his wife leaves him for another man, David follows the footsteps of his brother, who now a dog, arrives at the Hotel to find a partner. He, like everyone else, is given 45 days to find one. If he fails, then he will be turned into an animal of his choice and released into the forest. “If I can’t find a soulmate I want to turn into a lobster. Because it lives for more than 100 years, and has blue colored blood, like aristocrats”, explains David about his choice during the interview. Soon he will realize that nothing’s better than being a human being… But how to be one if you can’t even determine your own future? On his second day, David makes acquaintances with a man with a lisp (John C. Reilly) and young man with a limp (Ben Whishaw). On his way to hunting after the Loners, Biscuit Woman (Ashley Jensen) promises that if she fails to find a mate she will kill herself by jumping off the hotel. To his great surprise, later on she will jump off, but from the first floor which causes too much noise for her neighbors, who would rather see her dying. That incident allows David to get closer to the Heartless Woman, however, that relationship ends fast when she kills David’s brother. This is when the second part of the story beings, and the most important one, when our hero finally meets the love of his life, the Short Sighted Woman (Rachel Weisz),who will walk you through the entire film as she narrates it. There are too many great scenes in “The Lobster” or lessons we all must learn. It constantly talks about being an animal and even the importance to become one if you have no one to share your evenings with. But the question you will ask yourself: “Why do I need to wait for someone’s guidance in order to live my life the way I want?” is what will hang in the air. The first half of the film is about how no one can be forced to love while the second is about: you can’t force someone not to love. Yes, indeed “The Lobster” gives you a variety of choices you as a viewer can make, and the ending, you can anticipate any way you wish – but it won’t happen for one simple reason – Yorgos Lanthimos. 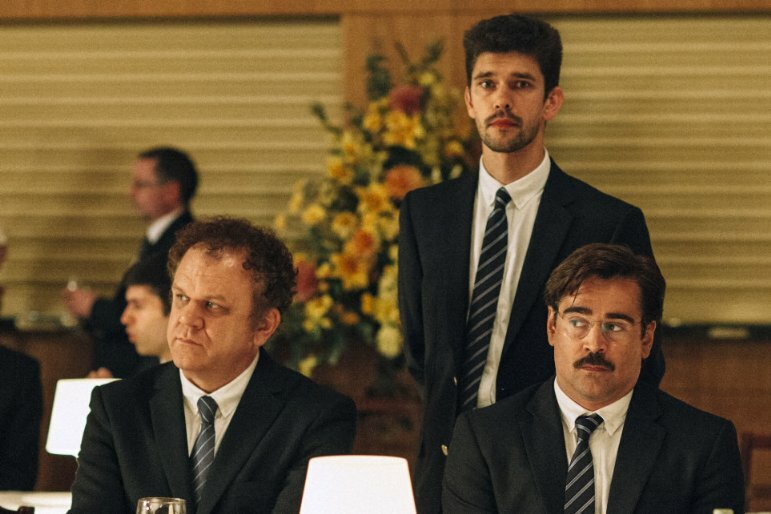 The plot and the directorial approach are not the only things that shines in “The Lobster”. While the entire cast does a tremendous job, it’s Collin Farrell and Rachel Weisz who will constantly grab your attention. The ease and natural performance they deliver will be stuck in your mind long after the film ends. The interview scene when Farrell’s David can’t decide in which group to put himself in, he takes a few seconds to answer to the question, the question, where you will be able to read his next line without hearing a single word. Weisz is an established actress who should have been recognized for her unique talent long time ago. Every time when she appears in the film, it is such a joy to watch her performance. Here, in “The Lobster” she finds her new self, a new character where she finally expresses herself as an actress who understands the character better than the person who created it. Vancouver (International Village) and Montreal!